In September 1992 the title was bought by TANDY Media with John Young remaining in his role as Editor. The magazine continued to flourish and sustained its objective from the first issue. After editing 205 issues of Shipping Today & Yesterday John Young stood down and the April 2006 issue saw Nigel Lawrence (the current Editor) take up the gauntlet. 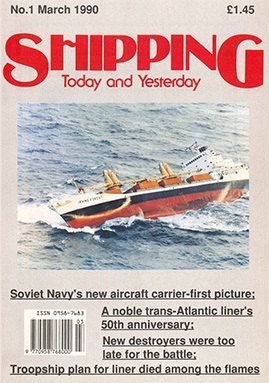 Shipping Today & Yesterday has changed and expanded considerably from its first issue, but it still provides the same informative news service and interesting features from the World of Merchant Shipping. This monthly magazine has a strong and loyal following throughout the UK and abroad and appeals to anyone with an interest in ships and life at sea, past or present. TANDY Media also produces Warships International Fleet Review. Warships IFR is a monthly title that brings you all the latest news and developments in the world’ s navies. Click on this link to locate a newsagent near you that stocks Shipping Today & Yesterday. Please note that we provide some free content on this site, to access more please register and for full access subscribe (payment required). From a variety of different shipping backgrounds, our writers love reporting what’s current and topical in the shipping world. If you wish to comment on any of our articles, and be featured in the monthly Editor’s Mailbox, please get in touch by emailing editor@shippingtandy.com.